From blood to the lab: the protein albumin is responsible for many vital processes in the human body. In nature it only appears as a solution when dissolved in water. Chemists at Martin Luther University Halle-Wittenberg (MLU) have developed a method of producing various albumin-based gels. Their findings may one day help to develop innovative drug carrier systems that more easily reach the bloodstream. 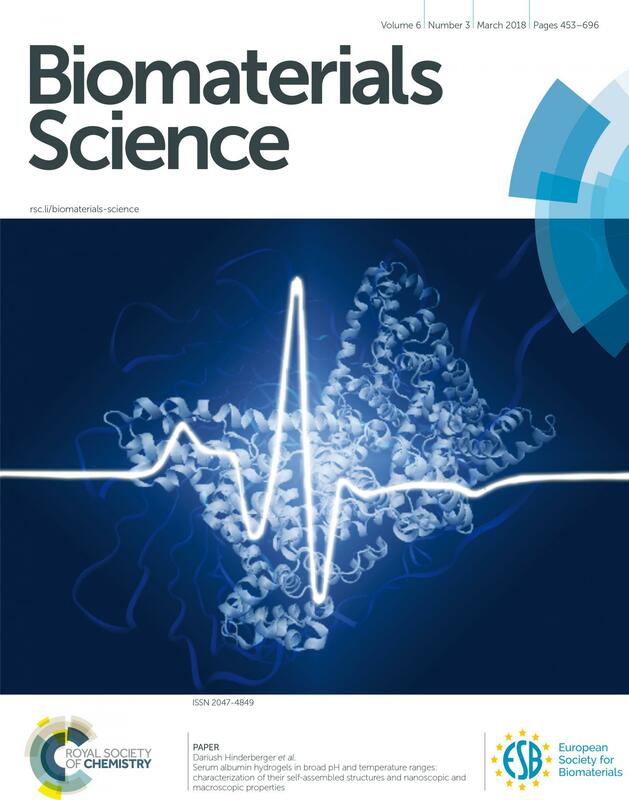 The study conducted by the researchers in Halle was recently featured on the cover of the international Journal Biomaterials Science published by the Royal Society of Chemistry. Albumin is a protein that is found in large quantities in the blood of all mammals. Human blood contains up to 60 grams per litre. "Albumin is responsible for many important processes in the body. It can penetrate cell membranes and is thus able to transport essential substances into the cells. It also helps to detoxify cells," says Professor Dariush Hinderberger, a chemist at MLU. He has been investigating albumin for more than ten years, studying the protein's structure, dynamics and transport properties. Today it is already being used by the pharmaceutical industry to produce vaccines and medicines – however not in gel form. "Until now albumin gels have been a somewhat annoying by-product of normal lab work," says Hinderberger. However, in the future they could be used to produce so-called drug-delivery implants. These would be injected once into the patient and would then settle in the body. The carrier would then slowly be broken down by the body and the desired substance would be released over a longer period of time. This could save patients from having to undergo repeated injections. "But in order to see whether potential albumin-based drug carrier systems can be developed, it is first necessary to understand how and why the gels form," says Hinderberger, summarising the idea behind his new study. In response, the chemists at MLU investigated various albumin solutions. "We wanted to find out what exactly happens to the protein particles and their structure when we modify certain properties," says Hinderberger. First the researchers tested how the solution's pH value affects gel formation. Then they heated up the liquid and analysed which changes occurred and at what stage. With the aid of infrared spectroscopy the group is now able to demonstrate how the structure of albumin changes when exposed to heat. The protein tangle opens up allowing it to more easily clump together with other substances to produce the gel. Based on these findings the research group was able to produce a different, much softer, gel. They did this by slowing down the gel formation process, lowering the temperature and choosing a solution with a relatively neutral pH value. "Under these conditions there was little change to the structure of the individual albumin molecules from which the other basic mechanical properties of the gel stem," explains Hinderberger.